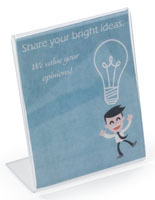 Why do so many businesses use the clear slant back table tents to promote important messages and attractive graphics? 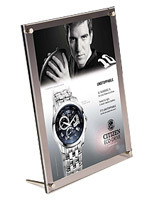 The acrylic frames have a simple design that will coordinate with the in store décor as well as the printed content. 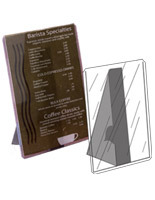 Transparent signage displays may be setup on any tabletop, countertop or other flat surface to capture the attention of curious shoppers. 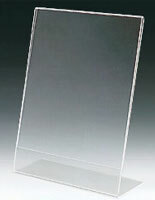 Traditional construction allows companies from all sorts of industry sectors to utilize the clear plastic fixtures. 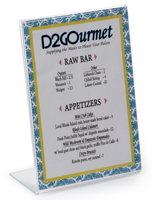 These affordable slant back table tents with durable acrylic fabrications, frequently referred to as angled sign holders, can be used on the tabletop in an eatery, cash wrap in a retail store or countertop at an information kiosk. 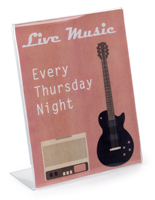 The signage displays come in different sizes and designs to best present the promotional content. 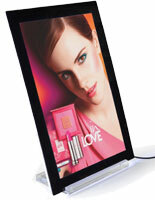 Choose the dimensions that will best suit the content and available displaying space. 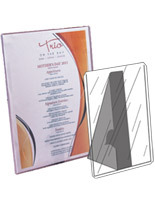 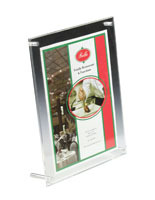 These slant back table tents are acrylic frames that only require a few moments to setup. 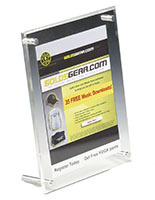 The angled sign holders lend themselves nicely to industries that frequently change the promotional campaigns. 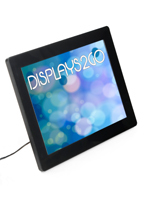 Countertop displays require minimal effort for installation. 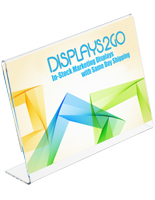 These tents may include slight embellishments to capture the attention of customers and add to the overall visual appeal of the promotional content. 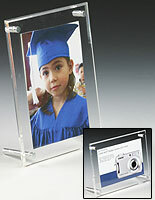 Clear acrylic frames might include binding screws for attractive corner accents. 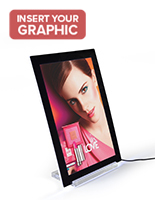 Merchants can even purchase angled sign holders with LED lighting built-in to highlight the graphics. 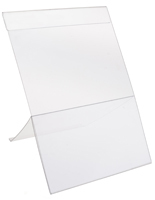 Wholesale tents protect the important content from dust, dirt and other mild elements. 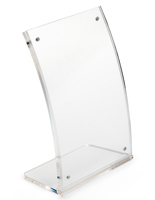 The acrylic frames are lightweight for easy positioning, but also surprisingly durable. 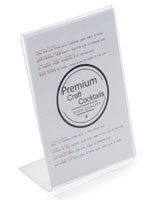 Store managers and advertisers can use the tabletop designs for a long time because the material can withstand normal wear and tear. 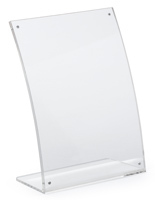 How do people load content into the angled sign holders? 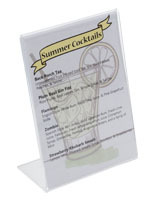 These slant back table tents come in various designs, but all of the styles are very easy to use. 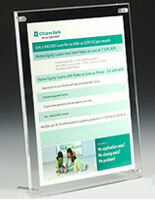 Many of the acrylic frames allow users to slide in advertising content from the side for convenient installation. 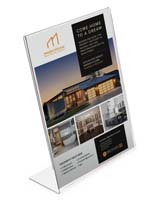 Simply separate the fold over construction for easy promotion. 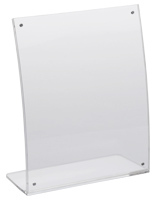 Similar to the side loading countertop styles, there are tabletop displays that load the information from the top. 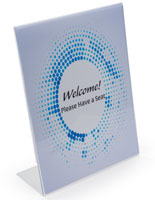 These economical signage fixtures come with a clear panel with a slot for quickly sliding the images into position. 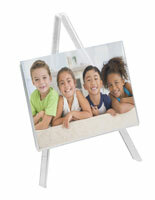 Frames of this ilk often come with a removable easel backer to support the signage. 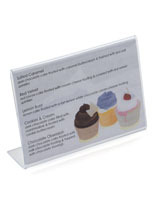 Other countertop image displays come feature a sandwich design for installing the graphics. 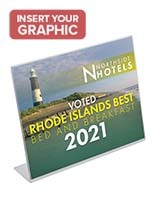 Users place the promotion in between the two panels. 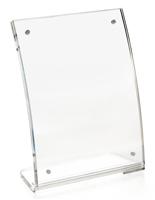 Once the perfect position is achieved, bind the panel together using the nickel plated screws. 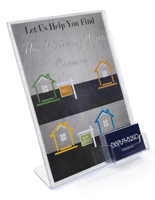 Corner hardware can make for aesthetically pleasing accent for the signage. 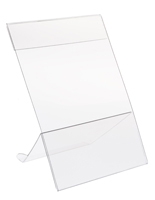 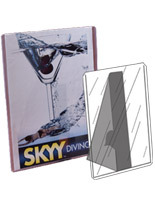 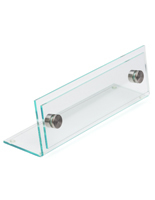 These slant back table supplies support all sorts of advertisements within the acrylic constructions. 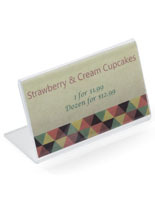 Sizes vary from 3.5" x 2" all the way up to 11" x 17" There are many different options for restaurants and retail stores advertising with traditional 8.5" x 11" prints. 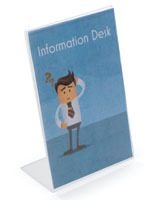 The supplies will accommodate a business card, small photograph or standard piece of printer paper. 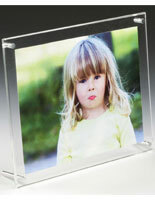 Landscape and portrait options can be found in the collection. 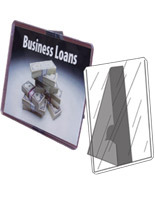 Some models are capable of both vertical and horizontal format. 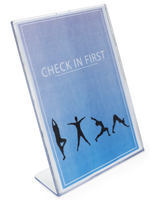 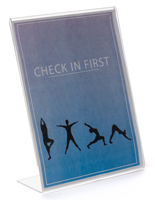 The stable bases on the tabletop displays make them a great choice for advertising graphics in almost any business.